Anup Mathew Thomas, from the series Metropolitan, 2006, colour photograph. LONDON, ENGLAND.- Gasworks presents Anup Mathew Thomas - Metropolitan, on view through March 25, 2007. Metropolitan will be the first solo exhibition in the UK by Anup Mathew Thomas. Predominantly producing work in series, Mathew Thomass photographs are visually seductive yet conceal an inherent critique of their subject matter. His exhibition at Gasworks will present works that obliquely examine the rule-makers, law enforcers and bastions of ethics and morality within society. It will be an opportunity to see this singular young artist at a pivotal point in his career. Mathew Thomas will be presenting two recent works and a new series showing for the first time in this exhibition. 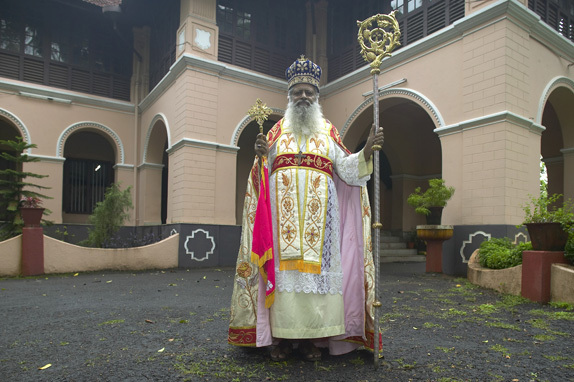 Metropolitan (2006), presents a series of fourteen individual portraits of Protestant Metropolitan archbishops from Kerala. The variety of style and colour within their ceremonial regalia expresses the sheer diversity within the denominations, drawing awareness to the remarkably plural social characteristics in this coastal state. More significantly, Mathew Thomas strategically depicts these pillars of society in front of their own large, imposing and rather luxurious-looking homes. His other recent series Light Life (2005) depicts the empty interiors of Mumbai nightclubs where men go to watch women dancing. Presented as a digital slideshow, the slowly changing stills of these evocative deserted venues seem alive with movement though devoid of human presence. Mathew Thomas shot the photographs on the eve of the nightclubss forced closure by the state authorities on the grounds that they encouraged prostitution. Light Life questions this decision as many ex-dancers were obliged to seek the very employment the censure sought to discourage. Anup Mathew Thomas is an artist with a subtle approach to documenting the people and places around him through a benevolent yet probing lens. Merging various genres of photography he appears the impartial observer yet subtly elucidates the politics involved. Mathew Thomas lives and works between India and the UK . He has had acclaimed solo exhibitions in India and presented work at Ars Electronica, Linz, Austria and at the 2004 Saint Etienne Biennale, France. He undertook a residency at Gasworks in 2006 as part of its International Residency Programme.